This article is about the Roman Goddess Terra Mater. For other uses, see Terra. 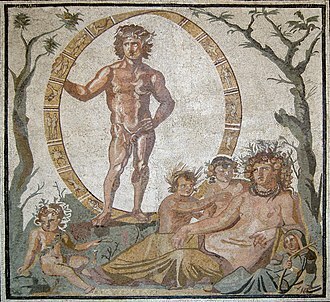 A syncretic Tellus reclining with four children, probably the Seasons, accompanied by Aion-Uranus within a zodiac wheel (mosaic from Sentinum, AD 200-250, Glyptothek). In ancient Roman religion and myth, Tellus Mater or Terra Mater ("Mother Earth") is a goddess of the earth. Although Tellus and Terra are hardly distinguishable during the Imperial era, Tellus was the name of the original earth goddess in the religious practices of the Republic or earlier. The scholar Varro (1st century BC) lists Tellus as one of the di selecti, the twenty principal gods of Rome, and one of the twelve agricultural deities. She is regularly associated with Ceres in rituals pertaining to the earth and agricultural fertility. The attributes of Tellus were the cornucopia, or bunches of flowers or fruit. She was typically depicted reclining. Her male complement was a sky god such as Caelus (Uranus) or a form of Jupiter. A male counterpart Tellumo or Tellurus is mentioned, though rarely. Her Greek counterpart is Gaia, and among the Etruscans she was Cel. Michael Lipka has argued that the Terra Mater who appears during the reign of Augustus is a direct transferral of the Greek Ge Mater into Roman religious practice, while Tellus, whose temple was within Rome's sacred boundary (pomerium), represents the original earth goddess cultivated by the state priests. The word tellus, telluris is also a Latin common noun for "land, territory; earth," as is terra, "earth, ground". In literary uses, particularly in poetry, it may be ambiguous as to whether the goddess, a personification, or the common noun is meant. This article preserves the usage of the ancient sources regarding Tellus or Terra. A dedicatory inscription to Terra Mater fulfilling a vow (votum), 1st century AD. The 4th-century AD Latin commentator Servius distinguishes between tellus and terra in usage. Terra, he says, is properly used of the elementum, earth as one of the four classical elements with air (Ventus), water (Aqua), and fire (Ignis). Tellus is the goddess, whose name can be substituted (ponimus ... pro) for her functional sphere the earth, just as the name Vulcanus is used for fire, Ceres for produce, and Liber for wine. Tellus thus refers to the guardian deity of Earth and by extension the globe itself. Tellus may be an aspect of the numen called Dea Dia by the Arval priests, or at least a close collaborator with her as "divinity of the clear sky." Not without cause was the Earth (Terra) called Mater and Ceres. It was believed that those who cultivated her led a pious and useful life (piam et utilem ... vitam), and that they were the sole survivors from the line of King Saturn. Ovid distinguishes between Tellus as the locus ("site, location") of growth, and Ceres as its causa ("cause, agent"). Mater, the Latin word for "mother," is often used as an honorific for goddesses, including Vesta, who was represented as a virgin. "Mother" therefore expresses the respect that one would owe a mother, though Tellus and Terra are both regarded as mothers in the genealogical sense as well. The Temple of Tellus was the most prominent landmark of the Carinae, a fashionable neighborhood on the Oppian Hill. It was near homes (domūs) belonging to Pompey and to the Cicero family. The temple was the result of a votum made in 268 BC by Publius Sempronius Sophus when an earthquake struck during a battle with the Picenes. Others say it was built by the Roman people. It occupied the former site of a house belonging to Spurius Cassius, which had been torn down when he was executed in 485 BC for attempting to make himself king. The temple constructed by Sophus more than two centuries later was most likely a rebuilding of the people's. The anniversary (dies natalis) of its dedication was December 13. A mysterious object called the magmentarium was stored in the temple, which was also known for a representation of Italy on the wall, either a map or an allegory. A statue of Quintus Cicero, set up by his brother Marcus, was among those that stood on the temple grounds. Cicero claims that the proximity of his property caused some Romans to assume he had a responsibility to help maintain the temple. Detail from a sarcophagus depicting a Mother Earth figure (3rd century AD). Festivals celebrated for Tellus were mainly concerned with agriculture and often connected with Ceres. In January, both goddesses were honored as "mothers of produce" at the moveable feast (feriae conceptivae) of Sementivae, a festival of sowing. On December 13, the anniversary of the Temple of Tellus was celebrated along with a lectisternium (banquet) for Ceres, who embodied "growing power" and the productivity of the earth. "By the death of cattle, King, Tellus must be placated: two cows, that is. Let a single heifer yield two lives (animae) for the rites." Numa solved the riddle by instituting the sacrifice of a pregnant cow. The purpose of the sacrifice, as suggested by the Augustan poet Ovid and by the 6th-century antiquarian John Lydus, was to assure the fertility of the planted grain already growing in the womb of Mother Earth in the guise of Tellus. This public sacrifice was conducted in the form of a holocaust on behalf of the state at the Capitol, and also by each of the thirty curiae, the most ancient divisions of the city made by Romulus from the original three tribes. The state sacrifice was presided over by the Vestals, who used the ash from the holocaust to prepare suffimen, a ritual substance used later in April for the Parilia. During the Secular Games held by Augustus in 17 BC, Terra Mater was among the deities honored in the Tarentum in the Campus Martius. Her ceremonies were conducted by "Greek rite" (ritus graecus), distinguishing her from the Roman Tellus whose temple was within the pomerium. She received the holocaust of a pregnant sow. The Secular Games of 249 BC had been dedicated to the underworld deities Dis pater and Proserpina, whose underground altar was in the Tarentum. Under Augustus, the Games (ludi) were dedicated to seven other deities, invoked as the Moerae, Iuppiter, Ilithyia, Iuno, Terra Mater, Apollo and Diana. The sacrum ceriale ("cereal rite") was carried out for Tellus and Ceres by a flamen, probably the Flamen Cerialis, who also invoked twelve male helper gods. According to Varro, the two goddesses jointly received the porca praecidanea, a pig sacrificed in advance of the harvest. Some rites originally pertaining to Tellus may have been transferred to Ceres, or shared with her, as a result of her identification with Greek Demeter. Tellus was felt to be present during rites of passage, either implicitly, or invoked. She was perhaps involved in the ceremonies attending the birth of a child, as the newborn was placed on the ground immediately after coming into the world. Tellus was also invoked at Roman weddings. Dedicatory inscriptions to either Tellus or Terra are relatively few, but epitaphs during the Imperial period sometimes contain formulaic expressions such as "Terra Mater, receive me." In the provincial mining area of Pannonia, at present-day Ljubija, votive inscriptions record dedications to Terra Mater from vilici, imperial slave overseers who ran operations at ore smelting factories (ferrariae). These are all dated April 21, when the founding day (dies natalis, "birthday") of Rome was celebrated, perhaps reflecting the connection between the Parilia on April 21 and the Fordicidia as a feast of Tellus. The emperor Septimius Severus restored a temple of Terra Mater at Rudnik, a silver mining area of Moesia Superior. Measuring 30 by 20 meters, the temple was located at the entrance to the work zone. The attributes of the central figure on this panel of the Ara Pacis mark her as an earth and mother goddess, often identified as Tellus. Tellus is often identified as the central figure on the so-called Italia relief panel of the Ara Pacis, which is framed by bucrania (ornamental ox heads) and motifs of vegetative and animal fertility and abundance. Tellumo is identified by St. Augustine as the male counterpart of Tellus. A Tellurus is named uniquely by Martianus Capella (1.49). In several modern Romance languages, terra (or French terre) is the name of planet Earth. Following post-classical Latin astronomical terminology, Earth is sometimes referred to as "Terra". Wikimedia Commons has media related to Tellus. ^ Gary Forsythe, Time in Roman Religion: One Thousand Years of Religious History (Routledge, 2012), p. 73; Christopher M. McDonough, "Roman Religion," in The Oxford Encyclopedia of Ancient Greece and Rome (Oxford University Press, 2010), vol. 1, p. 97. ^ Marion Lawrence, "The Velletri Sarcophagus," American Journal of Archaeology 69.3 (1965), p. 212. ^ Michael Lipka, Roman Gods: A Conceptual Approach (Brill, 2009), pp. 151–152 et passim. ^ Augoustakis, Motherhood and the Other, p. 124, citing the entry on tellus in Ernout-Meillet, Dictionnaire Etymologique De La Langue Latine. ^ Servius, note to Aeneid 1.171. ^ Entry on "Tellus," in The Oxford Classical Dictionary (Oxford University Press, 1996), p. 1480. ^ William Warde Fowler, The Roman Festivals of the Period of the Republic (London, 1908), p. 74, concurring with Ludwig Preller. ^ Robert Schilling, "Rome," in Roman and European Mythologies (University of Chicago Press, 1992, from the French edition of 1981), p. 114. ^ Varro, De re rustica 3.1.5, as cited by Hendrik Wagenvoort, "Initia Cereris," in Studies in Roman Literature, Culture and Religion (Brill, 1956), p. 153. ^ Ovid, Fasti 1 (671–674); Georges Dumézil, Camillus, edited and translated by Udo Strutynski (University of California Press, 1980), p. 77. ^ Suetonius, Grammatici 15; Servius, note to Aeneid 8.361. ^ Lawrence Richardson, A New Topographical Dictionary of Ancient Rome (Johns Hopkins University Press, 1992), pp. 71, 378. According to Taylor, "The Mother of the Lares," p. 306, it was on the lower slopes of the Esquiline Hill. ^ His domus rostrata, the house that was ornamented with the prows (rostra) from the so-called Cilician pirates: Suetonius, Grammatici 15; Appian, Bellum Civile 2.126; Ann Kuttner, "Culture and History at Pompey's Museum," Transactions of the American Philological Association 129 (1999), p. 349; Richardson, Topographical Dictionary, pp. 133 and 378. ^ Plutarch, Life of Cicero 8.3; Cicero, Letters to My Brother Quintus 2.3.7; Richardson, Topographical Dictionary, p. 378. ^ Florus 1.14.2; Richardson, Topographical Dictionary, p. 378. ^ Valerius Maximus 6.3.1b; Dionysius of Halicarnassus 8.79.3. ^ Cicero, De domo sua 101; Livy 2.41.11; Dionysius of Halicarnassus 8.79.3; Valerius Maximus 6.3.1b. ^ Richardson, Topographical Dictionary, p. 378. ^ Cicero, De haruspicum responsis 31; John E. Stambaugh, "The Functions of Roman Temples," Aufstieg und Niedergang der römischen Welt II.16.1 (1978), p. 571; Richardson, Topographical Dictionary, p. 379. ^ Varro, De re rustica 1.2.1; Karl-J. Hölkeskamp, "Conquest, Competition and Consensus: Roman Expansion in Italy and the Rise of the Nobilitas," Historia 42.1 (1993), p. 28; Richardson, Topographical Dictionary, p. 378–379. ^ Cicero, Letters to My Brother Quintus 3.1.6 and 14; T.P. Wiseman, "The Ambitions of Quintus Cicero," Journal of Roman Studies 56 (1966), p. 110; William C. McDermott, "Q. Cicero," Historia 20 (1971), p. 107. ^ Cicero, De haruspicum responsis 31. ^ Frugum matres, Ovid, Fasti 1.671. ^ H.H. Scullard, Festivals and Ceremonies of the Roman Republic (Cornell University Press, 1981), p. 68, regards the regular date as January 24–26. ^ Wagenvoort, "Initia Cereris," p. 159ff. Wagenvoort argues that Ceres herself originated as the generative aspect of Tellus. ^ Mary Beard, J.A. North, and S.R.F. Price, Religions of Rome: A History (Cambridge University Press, 1998), vol. 1, p. 45. ^ Wagenvoort, "Initia Cereris," p. 163. ^ Fowler, Roman Festivals, p. 67. ^ Ovid, Fasti 4.641–666: morte boum tibi, rex, Tellus placanda duarum: / det sacris animas una iuvenca duas. ^ Vyacheslav V. Ivanov, "Fundamentals of Diachronic Linguistics", Semiotics around the World: Synthesis in Diversity (Mouton de Gruyter, 1994), vol. 1, pp. 64–66, with discussion of Vedic and Hittite parallels. ^ Ovid, Fasti 4.633f. ; John Lydus, De Mensibus 4.49, drawing on Varro, as noted by Fowler, Roman Festivals, p. 71. See also Beard et al., Religions of Rome, p. 53. ^ Fowler, Roman Festivals, pp. 71 and 303; Christopher John Smith, The Roman Clan: The gens from Ancient Ideology to Modern Anthropology (Cambridge University Press, 2006), p. 207. ^ Ovid, Fasti 4.731–734; Daniel P. Harmon, "Religion in the Latin Elegists", Aufstieg und Niedergang der römischen Welt 2.16.3 (1986), p. 1958; Fowler, Roman Festivals, p. 71; Beard et al., Religions of Rome pp. 53 and 383. ^ Lipka, Roman Gods, pp. 151–152, 157. ^ Lipka, Roman Gods, p.150. ^ Varro, Antiquitates frg. 266 (edition of Cardauns), Servius Danielis, note to Georgics 1.21, citing Fabius Pictor; Jörg Rüpke, Religion in Republican Rome: Rationalization and Ritual Change (University of Pennsylvania Press, 2012), p. 181; Lipka, Roman Gods, pp. 57 and 69. ^ As cited by Nonius, p. 240 in the edition of Linday, as cited by Schilling, "Rome," in Roman and European Mythologies, p. 122. ^ Cato, On Agriculture 134, and Aulus Gellius, Attic Nights 4.6.8, name Ceres as the sole recipient. ^ Schilling, "Cicero as Theologian," in Roman and European Mythologies, p. 124. ^ Servius, note to Aeneid 4.166; Spaeth, The Roman Goddess Ceres, p. 5. ^ Lily Ross Taylor, "The Mother of the Lares," American Journal of Archaeology 29.3 (1925), p. 304. ^ William Warde Fowler, The Religious Experience of the Roman People (London, 1922), p. 122. ^ Alfred Michael Hirt, Imperial Mines and Quarries in the Roman World: Organizational Aspects 27 BC–AD 235 (Oxford University Press, 2010), sect. 6.2; Slobodan Dušanić, "Aspects of Roman Mining in Noricum, Pannonia, Dalmatia and Moesia Superior," Aufstieg und Niedergang der Römischen Welt 2.6 (1977), pp. 58–59. ^ Dušanić, "Aspects of Roman Mining," pp. 59–60. ^ CIL 3.8333; Dušanić, "Aspects of Roman Mining," pp. 59 (note 29), 78. ^ Dušanić, "Aspects of Roman Mining," p. 78. ^ Denis Feeney, "Interpreting Sacrificial Ritual in Roman Poetry: Disciplines and Their Models," in Rituals in Ink: A Conference on Religion and Literary Production in Ancient Rome (Franz Steiner, 2004), p. 12. For more on the iconography of Tellus, see Lexicon Iconographicum Mythologiae Classicae 7.1.879–89. ^ Augustine, De Civitate Dei 7.23. ^ Roger D. Woodard, Indo-European Sacred Space: Vedic and Roman Cult (University of Illinois Press, 2006), p. 115; William Harris Stahl with E.L. Bruge, Martianus Capella and the Seven Liberal Arts: The Marriage of Philology and Mercury (Columbia University Press, 1977), p. 23. This page was last edited on 12 February 2019, at 19:31 (UTC).